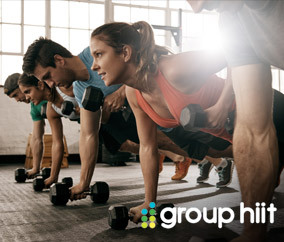 Group HIIT Membership - 40% Off! Get a Group HIIT membership for 40% off each month with your T+L Family Club membership! Discount recurring for length of membership. Don’t let your busy schedule get in the way of your fitness goals. Exercise anytime, anywhere with easy-to-follow online workout videos from Group HIIT. Choose from 175+ effective High Intensity Interval Training (HIIT) workouts designed for all levels. Get fit with your friends, family, or coworkers—no gym membership required. Little to no equipment needed!